PSNews - The People's Public Security Forces has closely followed the sound leadership and direction of the Party and State to excellently accomplish their main tasks of protecting national security and ensuring social order and safety while also demonstrating a high political determination for innovating, streamlining the organization for effectiveness and efficiency. 2018 was a year of success of the People's Public Security Forces as the forces excellently accomplished their main tasks of protecting national security and ensuring social order and safety, achieved and exceed the objectives, requirements of their tasks set out earlier. 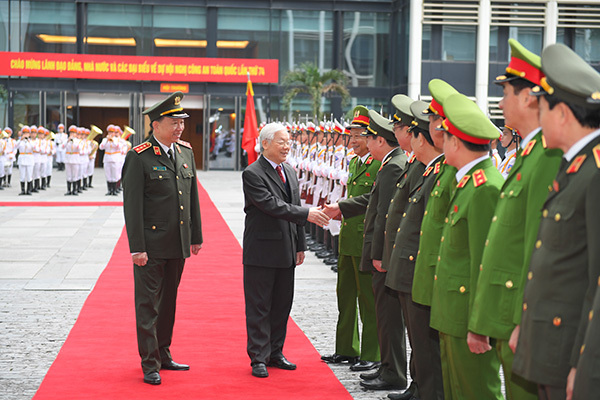 Party General Secretary, President Nguyen Phu Trong; Minister of Public Security To Lam and high-ranking delegates of the People's Public Security Forces at the 74th National Public Security Conference. 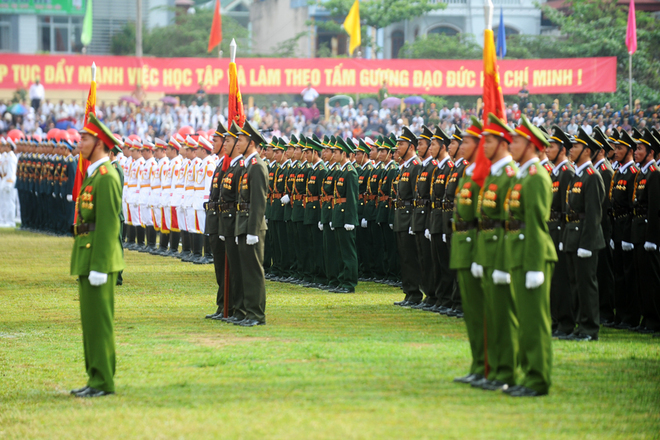 Firstly, the People Public Security Forces set example and took the lead in implementing Resolution No.18 issued by the Sixth Meeting of the 12th Communist Party of Vietnam Central Committee (CPVCC), and Resolution No.22 by the Politburo, realizing strong political determination of the Public Security Central Party Committee and and great effort of the entire forces in implementing the Party and State guidelines on renovating and streamlining the Ministry of Public Security apparatus for more efficiency and effectiveness. After implementing the policy of the Politburo and the Decree of the Government, the Ministry of Public Security's apparatus has been streamlined with no general department and fewer department-level units. Meanwhile, the communal police force has been strengthened with the reinforcement of regular police officers. During the year, the Ministry of Public Security also took comprehensive measures to promote Party building and force building, with a focus on developing an absolute loyal force to the Party, the Fatherland and the people. The Public Security Central Party Committee also well implemented the 12th Party Central Committee’s Resolution No.04 on strengthening Party building and Directive No.5 of the Politburo on enhancing the movement "Learning and following Ho Chi Minh's thoughts, morals and lifestyle", while focusing on Regulation No. 101 of the CPVCC’s Secretariat on the responsibility for setting examples of cadres and Party members, especially key leaders at all levels in line with strictly handling officers with wrongdoings. Secondly, the Public Security Forces have well performed their function of grasping, analyzing, forecasting the situation to provide timely advice for the Party and the State to give guidelines and policies on politics, economy, foreign affairs as well as on protection of national interests, and maintenance of security and social order. The Public Security Forces have also actively followed the Party and State guidance in grasping the global and regional situations and in time advised the Party and the State on guidelines and solutions to ensure national security and interests. Thirdly, the People Public Security Forces developed plans and taken drastic measures to ensure absolute security and safety for the country's important political events and all Party and State leaders during the year. Especially, the forces have denied any hostile political organizations from forming their bases inside the country while preventing and neutralizing their bad plots and sabotage activities against the Party and the State. Fourthly, the Public Security Forces have reached all targets and surpassed several of the targets, set out by the National Assembly in preventing and controlling crimes. With the forces’ efforts and preventive measures, of the number of criminal cases in 2018 has contracted 0.61% compared to 2017 while the fight against crimes has achieved good results. During the year, the forces launched a number of high-intensity campaigns to attack criminals, and discovered and handled more than 43,000 criminal cases. During the year, the police force also cracked down on 3,000 gangs and successfully investigated many cases related to criminals using military weapons, explosives, transnational crimes and crimes with foreign elements. Fifthly, the police force has also gained notable achievements in the fight against economic crime, corruption and fraud by abuse of position. The police have focused on the investigation into corruption cases under the guidance of the Central Steering Committee for Anti-Corruption. The work has been recognized by the Party and the State, and the people. Sixthly, the police have achieved a large number of good results in the fight against drug-related crimes. During the year, the police stamped out many large and complicated drug-trafficking rings and completely destroyed drug hubs, creating a safer living environment for the people. Remarkably, the force has successfully cracked down on a large and dangerous drug-related criminal group in Long Luong commune, Van Ho district, Son La province. Seventhly, in 2018, the legal and administrative and judicial reform sector under the Ministry of Public Security achieved important results. During the year, the Ministry of Public Security, particularly the drafting groups, focused on building and improving the legal system on security and social order while successfully completing and submitting the Law on Cyber Security, Public Security Law (amended), Law on Amnesty (amended), Law on Protection of State Secrets, and submitted them to the National Assembly for approval. The ministry has also proposed the Government to promulgate 6 decrees. At the same time, the Minister of Public Security issued 6 inter-discipline circulars and 41 circulars. The Ministry of Public Security has also completed a specific plan to simplify 114 administrative procedures, including 37 procedures at the Central level, 39 procedures at the provincial level, 22 procedures at the district level and 16 procedures at commune level as well as proposed to abolish and cancel 27 administrative procedures. 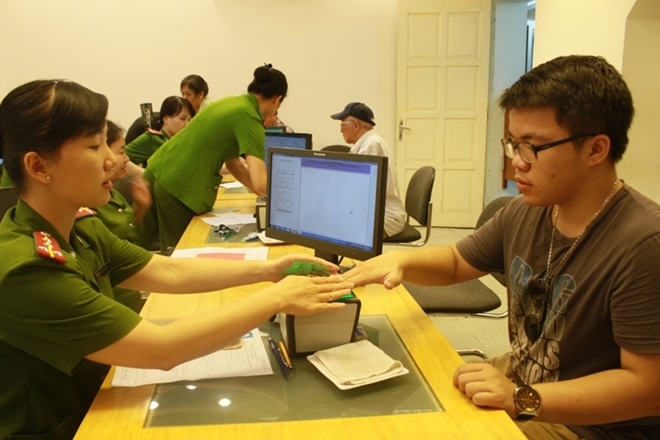 Eighthly, regarding the State management of security and order, the Public Security Forces have well managed the entry, exit and residency of foreigners. Meanwhile, the traffic police force has effectively performed its function of State management of traffic order and safety, and the fire police force has opened general fire prevention inspections in large cities and industrial parks; as a result, the human and material loses in fire and explosion cases have been controlled. Ninthly, the staff work, foreign affairs, inspection, and scientific and strategic research have also gained large fruits. The staff work has been innovated. So staff work agencies of units at all levels proactively studied the situation in association with the units’ political tasks, promptly gave good recommendations to leaders and commanders of the public security units at all levels in making decisions and directing forces to effectively implement both regular and unexpected tasks. During 2018, the public security foreign affairs sector strengthened both multilateral and bilateral relations and expanded international cooperation. Representatives of the Ministry of Public Security co-chaired many bilateral security dialogues with other countries, attended multilateral security forums, visited other countries and received high-ranking foreign delegations. In short, the year of 2018 has marked an expansion of relations and cooperation in both multilateral and bilateral terms between the Vietnamese Ministry of Public Security and foreign law enforcement agencies of foreign countries and international security organizations. Meanwhile, the inspection work has been enhanced. As a result, violations inside the force has been detected and handled while shortcomings and limitations of public security units have been discussed and overcome. 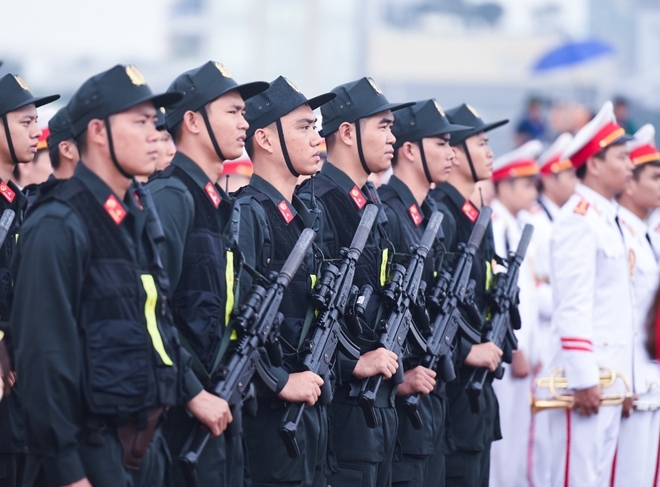 Tenthly, the Public Security Forces in collaboration with ministries, branches, functional agencies, especially the Vietnam People's Army, successfully deployed and fulfilled many major working plans while further spreading the movement “Protecting National security” across the society.